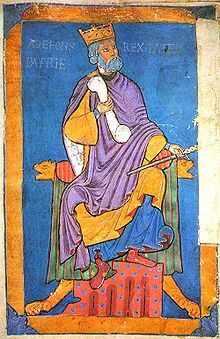 13th century miniature of Alfonso VI from the Tumbo A codex at the Cathedral of Santiago de Compostela. سککیزینجی آلفونسوی (اینگیلیسی‌جه: Alfonso VI of León and Castile) بیر شاهی ایدی. آتاسی بیرینجی فردیناند دیر.